The sexual abuse of minors and greed by members of the clergy have left Christians wounded, a Servite priest told the pope and Vatican officials during their Lenten retreat. "Pedophilia and the attachment to money are the two behaviors of the clergy that have most wounded and angered the Christian people," Servite Father Ermes Ronchi said during the retreat on March 9. The church, he said, is capable of being transparent like Christ, who "never allowed himself to be bought and never entered the palaces of the powerful as anything other than a prisoner." 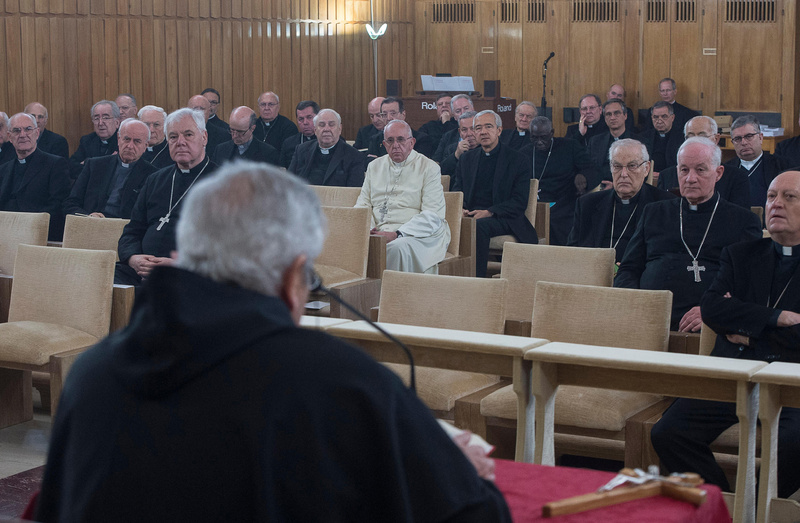 Father Ronchi, a member of Rome's Pontifical "Marianum" theological faculty, was chosen by Pope Francis to lead the March 6-11 retreat for the Roman Curia at the Pauline Fathers' retreat center in Ariccia, 20 miles southeast of Rome. In his morning meditation on March 9, the Italian theologian reflected on a question asked by Jesus prior to miraculously feeding thousands: "How many loaves do you have?" This question, he said, "is asked to all of his disciples, even today: How much money do you have? How many houses? How many jewels do you possess, perhaps in the form of a cross or a ring?" The Servite priest told the members of the Roman Curia that the church must not be afraid of transparency or "of clarity on its own loaves and fishes, on its own goods." "It is instead the smokescreens that are raised and evasive answers behind which we shield ourselves that erode trust and credibility," Father Ronchi said. Like those who gave their five loaves and two fishes in order to feed thousands, Father Ronchi urged Vatican officials to place their goods in Jesus' hands "without calculating, without holding anything back for yourselves." "If I offer my bread and I give a hungry person something to eat, I do not change the world; I do not change the structures of inequality," he said. "But, I have introduced the idea that hunger is not invincible, that the hunger of others is also my concern, that I should not cast aside those in need and that sharing is the most proper human form."